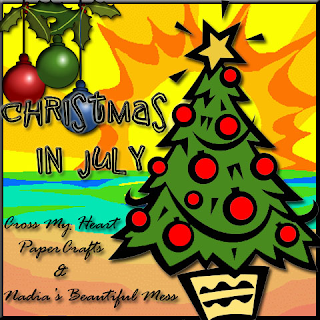 Create your Classroom: CHRISTMAS IN JULY BLOG HOP CELEBRATION!!!!!!!! Welcome to Day # 5 Of Christmas In July Celebration!! The theme for today's projects is "Homemade Gifts". Please visit Giselle's Blog to see all the wonderful projects being showcased throughout the day. It is NEVER too early to start working on those Christmas gifts! I chose this gift for the blog hop because it can be pre-made in the summer months! For all of those gardeners out there who grow zucchini-shred it and freeze it OR make and bake this fantastic bread and freeze it. It should keep for up to 6 months. I was Leary the very first time I made this bread, but after I baked it-there was not a crumb to be found!!!!!!!!!! The gooey chocolate chips, nuts, and moist cake/bread melts in your mouth! What a wonderful treat to surprise your child's teacher, bus driver, or babysitter!! Not to mention your family, friends, and neighbors. I hope you have a chance to try this easy and delicious recipe. I cut the cardstock at 12' by 6 "
In large bowl, combine flour, cocoa, cinnamon, baking soda, baking powder and salt; mix well. In separate bowl, combine sugar and eggs; beat (I whisk) until well blended. Add oil and vanilla; beat until combined. Stir in zucchini. Add flour mixture; stir until just moistened. Stir in nuts and chocolate chips. Spoon evenly into loaf pans. Bake at 350 for 55-60 minutes, or until toothpick inserted comes out clean. Cool in pan for 15 minutes. Remove bread from pans; cool completely on wire rack. Sounds really yummy Wendy! Love how you packaged the bread! I'll be trying this recipe, love the packaging and the tag. I love Zucchini bread and always looking for a yummier recipe..thanks for sharing!! Yum! Sounds delicious! Thanks so much for sharing! Super great idea!! I am glad when I see Imagine projects since I admit I don't use that often. Thanks for the inspiration!